I really liked the look of this top from the 1980s. I thought it would suit me, as it is sleeveless, and suitable to team with wide pants (as were popular in the eighties - and I am told are suitable for my current age and shape!). The original was made in a flecked wool, and I did not notice that it was dotted all over. So having made the discovery of the dots, I like it even more. 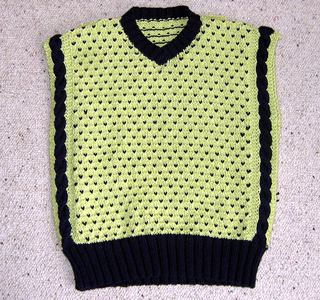 The dots add to the complexity when knitting, but the shape is very simple and quick to knit. 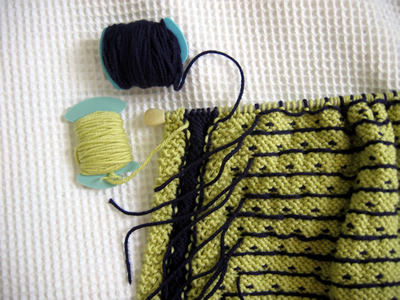 This pattern is worked in several sections including intarsia techniques, (to insert the vertical colour for the cable stripes); and jaquard (to make the dots). For the cables, and edge stitches, do not strand yarn across wrong side of work, but use separate balls: this will be 2 bobbins for the Navy cables and 2 bobbins for the Citron edge stitches. Twist the colours on wrong side where they meet to avoid a hole. Use your main ball of wool for the centre section in Citron (main shade), again twisting it where it meets the navy cable bobbin. When working the row of coloured dots join in and break off the navy at the beginning and end of the row. With No 10 needles and contrast colour, cast on 70 [74, 78, 86, 90, 94, 102, 106, 114] sts and work in K2, P2 rib for 3 [3, 4, 4, 5, 6, 6, 6, 6] cm, (rows on right side having K2) at each end. End with right side facing for next row and increase 1 st at end of last row (71 [75, 79, 87, 91, 95, 103, 107, 115] sts). 1st Row: (Right side facing) K3 in main shade (M) from bobbin, k6 in contrast (C) from bobbin, knit in main shade ball to last 9 sts; k6 in C from bobbin, k3 in M from bobbin. 2nd Row: K3 in M, p6 in C; change to main shade ball M and k3, purl to last 12 sts; k3; p6 in C, k3, in M.
k3 in M; *p3 in M, put M yarn to back of work; join in C and, using your separate strand of contrast, k1 in C, then bring M forward again for your next purl stitch; repeat from * (stranding the unused yarn colour across the back of the work) to last 15 sts, break off separate strand of contrast C; p3 in M, k3 in M, k6 in C, K3 in M.
k3 in M; *p1 in M, put M yarn to back of work; join in C and, using your separate strand of contrast, k1 in C, then bring M forward again p2 in M; repeat from * (stranding the unused yarn colour across the back of the work as before) to last 15 sts; p1 in M, put M yarn to back of work, k1 in C, bring M forward again p1 in M; k3 in M, C6B in C, K3 in M.
Continue in pattern until back measures 34 [37, 41, 43, 46, 48, 49, 51, 51] cm, ending with right side facing for next row. Shape shoulders by casting off 11 [12, 13, 9, 10, 12, 11, 12, 13] sts at beg of next 2 rows, then cast off 12 [12,12, 10,10,10,12, 12, 13] sts at beg of next 2 [2, 2, 4, 4, 4, 4, 4, 4] rows. Leave remaining 25 [27, 29, 29, 31, 31, 33, 35, 37] sts on a spare needle. Work as for back until front measures 26 [29, 33, 35, 37, 39, 39, 41,41] cm, ending with right side facing for next row. Pattern 33 [35, 37, 41, 43, 45, 49, 51, 55] sts, k2tog, turn and leave remaining sts on a spare needle. Continue on these 34 [36, 38, 42, 44, 46, 50, 52, 56] sts for first side, decrease 1 stitch at neck edge on every row until 30 [30, 30, 34, 38, 40, 40, 42, 44 ] sts remain, then on every alt row until 23 [24, 25, 29, 30, 32, 35, 36, 39] sts remain. Work straight until Front matches Back to start of shoulder shaping, ending with right side facing for next row. Cast off 11 [12, 13, 9, 10, 12, 11, 12, 13] sts at beg of next row. Cast off remaining 12 sts. Cast off [10, 10, 10, 12, 12, 13]sts at the beginning of the next and following alternate row. With right side facing, rejoin yarn to remaining sts, cast off centre st, k2tog, pattern to end. With right side facing, using No 10 needles and Contrast, knit up 30 [30, 30, 34, 38, 38, 42, 42, 42] sts down left side of neck and work 7 [7,9, 9, 9, 9, 11, 11, 11] rows in p2, k2 rib, rows on wrong side having a p2 at each end. Cast off evenly in rib. With right side facing, using No 10 needles and Contrast, starting at centre front, knit up 30 [30, 30, 34, 38, 38, 42, 42, 42] sts to shoulder. Knit across 25 [27, 29, 29, 31, 31, 33, 35, 37] sts from back of neck increasing 3 [1, 3, 3, 1, 1, 3, 1, 3] sts evenly (58 [58, 62, 66, 70, 70, 78, 78, 82] sts). Work 7 [7, 9, 9, 9, 9, 11, 11, 11] rows in P2, K2 rib, rows on wrong side having P2 at each end. Cast off evenly in rib. Join left shoulder, then sew border in position, placing right over left. Join side seams leaving 14 [15, 16, 18, 19, 20, 21, 22, 24] cm down from shoulder free for armhole. Sew on button at neck. Pure wool double knitting 50g balls: 2 [3, 3, 4, 4, 4, 4, 5, 5] in main shade, and, 1 [1, 2, 2, 2, 2, 2, 3, 3] in contrast. A pair each of No 8 and 10 needles; (4mm and 3¼mm). 22 sts x 30 rows to four inches on 4mm needles in stocking stitch. To fit chest/bust 24 [26, 28, 30, 32, 34, 36, 38,40] inches; length from top of shoulders 13½ [14½, 16, 17, 18, 19, 19½, 20, 20] inches. The size I knitted is highlighted in bold red, and is close fitting on me (UK size 12). The recommended wool was a pure wool double knitting, yardage 120m per 50g ball. I used Rowan Wool Cotton to make it more summery, but the yardage on wool cotton is somewhat less at 113m per 50g ball. Main shade is 901 Citron, and, contrast is 909 French Navy. C6F: slip next 3 sts on cable needle and leave at front of work, k3, then k3 from cable needle. C6B: slip next 3 sts on cable needle and leave at back of work, k3 then k3 from cable needle.